The Enertrag proposal for the Blackmains site is to build seven wind turbines that will be 125 metres (410ft) high. The height of these turbines will be nearly TWICE the size of the turbines (76 metres) on the development at Drone Hill on Coldingham Moor which are currently being installed. (November and December 2011). At 125 metres they are enormous structures. To put them in perspective, Torness Power Station is approximately 70m high. 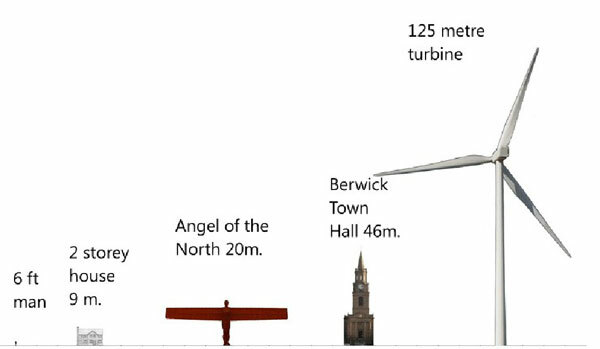 Blades for a 125m turbine are 45m long, nearly the height of Berwick’s Guild Hall. The seven turbines are positioned only 750 metres (which is less than half a mile) check from the outskirts of Ayton and Reston and the hamlets of Whitfield and Cairncross. Enertrag applied for planning permission for a temporary 80m meteorological mast which was approved by Scottish Borders Council Planning Committee on Monday 12 September 2012 despite over 90 objections submitted to the planners. Currently Enertrag are showing June 2012 as the month they will apply for planning permission for the seven 125 metre turbines. This could change – it could be earlier. If you agree that this development should be opposed then please sign up so we can keep you informed of the planning process and give you the timings to register your objections. The development would involve thousands of heavy truck movements in building access roads and excavating and constructing turbine foundations, hard standing areas and cable trenching. Turbine foundations are huge concrete structures. This is all left in place when the turbine tower is eventually removed. This amount of concrete and steel has a very large CO2 burden. If the Blackmains site has unstable ground conditions, some site areas might require ‘grouting’ (injecting liquid concrete) or deep-piling to provide secure turbine foundations. Concrete emits leachates and major ground works risk contamination of groundwater and pollution of watercourses.